The Partridge Berry opened in September of 2012. It is owned by Steve Barnette and started in a tiny window inside Barnette Furniture. The Partridge Berry became so popular that it has now grown into its own store with 2 locations to serve you. We offer big city gifts with small town service. 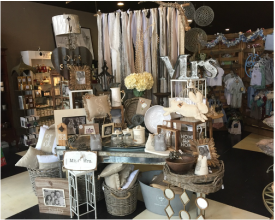 With a variety of unique gifts to choose from we are certain we have something for everyone! Stop in and see us today!